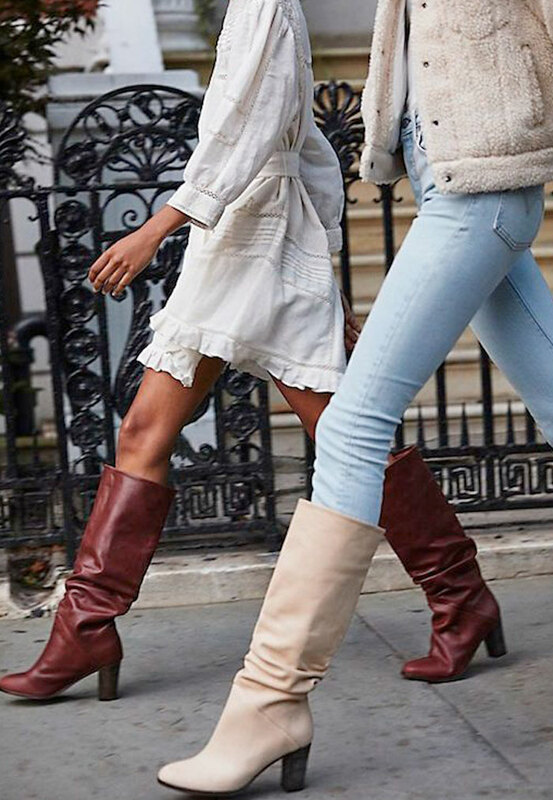 Fall Boot Guide: Everything You Need to Know! For me, fall is one of the best seasons of the year. It’s not super cold and not super hot- just perfect! I also love this season for the simple fact that I can wear pretty much anything (well, almost anything!) that I want. In this season, you finally have the chance to be fashionable and rock those jackets and boots you have been waiting all year to wear. Thinking of that, I decided to write this blog post and show you a full guide of really stylish and fun boots you can wear this season. Be creative and have fun! Let’s begin with one of the biggest trends in 2018 – white boots. Some people hate them, some people love them, but anyone can rock them if you style them right. White boots are not a new trend, it goes way back to the 1960’s in Los Angeles. “Whisky A Go-Go” was one of the most famous “discotheques” in America and became notable for many things, but perhaps mostly for their infamous go-go dancers – which were women suspended in cages dancing in signature white knee-high boots. It came back to life again in the ’80’s when Madonna and other famous artists were rocking them in concerts, movies, etc. In the modern day NOW, these are looked at as an accessory for strong and confident women that love fashion. So happy that these boots are back again! Not that they were gone, but all you would see in social media, artists, and fashionistas was the “over the knee boots” trend. It becomes boring when everybody does the same thing. The knee-high boots are delicate and can go with a ton of different styles, they look good with pants, skirt, dresses, shorts and a lot more. There are so many colors and styles, that it’s hard to choose only one. Yes! If you love animal print, (like I do!) you need to check some of the selections I made with a lot of cute boots down below. Whether you prefer leopard, snake effect, or even zebra, now is the time to update your closet and invest in one of these cuties. There are still a lot of people that “hate” this trend and refuses to wear anything that has animal print in it, and I kind of understand them. I would think the same way if I saw so many people wearing it wrong or overdoing it all the time. You have to know how to style these pieces otherwise it won’t look so good. Try finding some inspiration on Pinterest, there are so many choices and styles you can choose from. It will make life easier. If you are a fashionista and like to be on top of every single trend that comes out, you probably already know about the Cowboy Boots. Some famous designers have taken a turn due West. 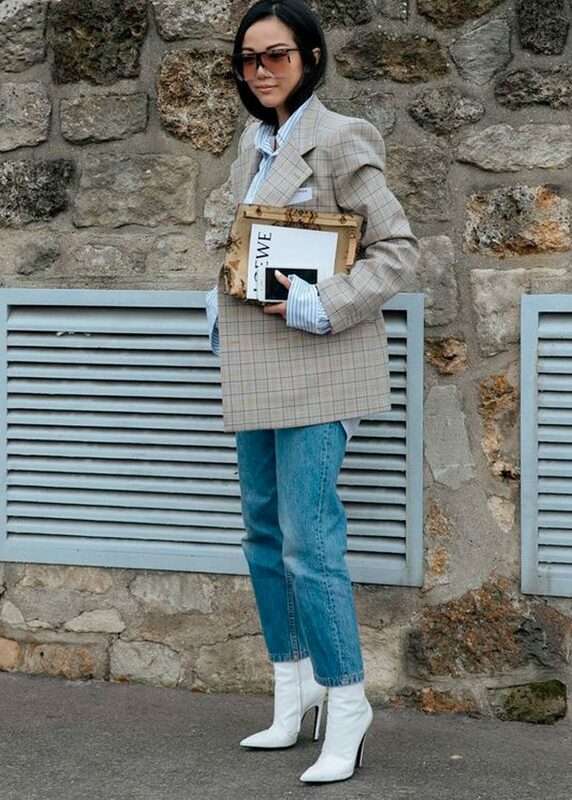 Fall’s runways including Calvin Klein, Fendi, and Isabel Marant championed the utilitarian boot and now the look has officially hit the street style scene. If you haven’t wore cowboy boots before, now it’s your chance to try them. For some people, this trend is weird and ugly, but you probably think that way because you don’t know how to style them correctly. It can actually look pretty good with dresses, jeans, skirt, shorts, so many different styles, and different occasions. You just have to try it and see it yourself. Another good thing about these boots is that they have so many different colors you can choose from. Because of that you will never get it wrong. You can always find purple sock boots that match perfectly with your mom jeans or a red vinyl pair that will look perfect with your leopard print jacket! I feel like this is another case of “love” and “hate”. Some girls think that ankle boots make you look chunky or that your legs look smaller, but that’s a mistake. These boots can actually look pretty good with your outfit if you know how to style them. There are so many options out there, just try to find the right one for you. In my case, I love to wear them with skinny jeans. It helps to keep your feet and ankles warm but also, looks super stylish. There are so many fun ones out there: wedge, flat, heel, cut-out, buckled, and the list could go on. And they’re so big for fall – you really should own a pair. Don’t be afraid! Which one is your favorite style? Let me know in the comments below! Designer Bags & Dupes for Cheap!